Ok. I'm done freaking out. Onto much more "cooler" things. Actually more like "colder." Tonight I decided last minute to participate in the little 5K Bonney Lake Fleet Feet fun run. I surprised Mel and her Muscle Man right before the little trek through the neighborhood. They were decked out in holiday garb! I was ill prepared as I decided to run an hour before the event and it turns out I wore ninja black for a night run...smart eh? I'll just say that I stuck to the sidewalks most of the time. At least my layers helped because it was freezing! 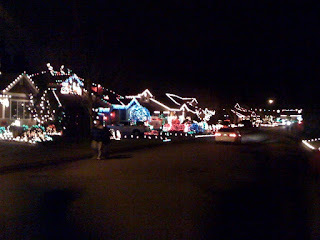 The run ended up just over 2 miles, but the neighborhoods we ran through had some gorgeous Christmas lights! It was fun to just go out and run with a bunch of people. Definitely more exciting than running my same 'ol neighborhood all by my lonesome. Thanks for the invite, Mel! Overall, I had an interesting evening full of laughter, running, and sneezing. Yes, sneezing. Some crazy sneeze monster exploded in my nose and caused me to have almost a 15 minute gesundheit-fest. And boy, I'm tired now! G'night! Care packages... how awesome! Lucky you! And sweet bloggy runner friend. 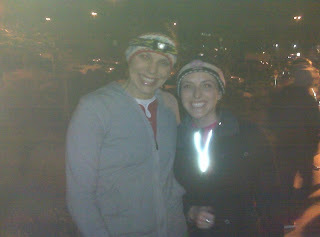 And to get to run w/ Mel and Muscle Man - with Christmas lights... how totally fun! Looks like you guys had a great time, and I really thought it was ganja (sp?)... ha ha! It's COLD here in Orlando, too... in the 40s this morning.. hee hee! Christmas light runs are so much fun! Totally cool that you surprised Mel. Really? A fear of Semis? even when they are parked? Funny. But then again, I am afraid of matches ... so really I guess it's not that strange! How fun!!! I wish we had some fun runs like this around here! Yay for another meet up with Mel! I can't remember if I told you or not...I used to be an editor for PACCAR, the parent company for Peterbilt and Kenworth trucks. So, I used to be a little nervous around those big trucks, too, but then I saw them in the plant where they are just little baby semis -- bolts and a chassis -- so I'm not so scared anymore. In fact, I think that picture IS a Peterbilt. 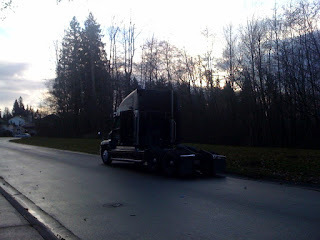 Hmmm, it might be a Kenworth. Definitely not a Volvo or a Freightliner. So jealous that you got to go on the Christmas light run. I was packing and wrapping till midnight. Merry Christmas to you and your hubs! PS: Don't freak out, but because of your post, Google Ads is putting semi truck advertisements on your page! What fun idea! 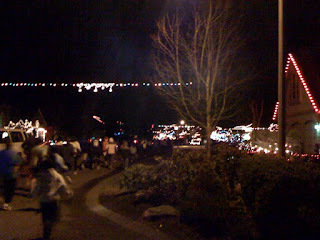 I hadn't even thought about a holiday lights run. Something I think I'll need to look forward to finding next year. So you're scared of semis huh? You need toad the movie Duel to your Halloween watching list. Sounds like you're definitely into the holiday spirit! Have a Merry Christmas! Oh no!!! With your fear of nekkid semis and my fear of Dogs we may be a funny pair..
Hugs to you and fun Christmas lights you are AWESOME!! Ummmm what are you doing Sunday? Latte 15 miler?? Hmmmmmm????? 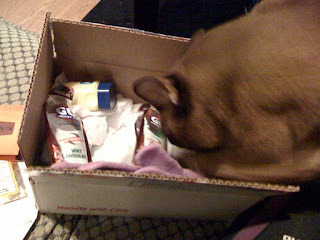 Well my kitty Suzy helped me pack that package up ... cute cute! Thank you for helping me name my Garmin! looks like a fun christmas light run! any big truck freaks me out. too funny about the "nekkid" ones. Just came over from you DailyMile post - I totally relate you your fear of Nekkie Semi's out for vengence. I have a fear that the road is two narrow - usually strikes at night on an interstate when I have to pass a semi. My sister-in-law has a fear that her car will go end over end down steep hills...we are not crazy! 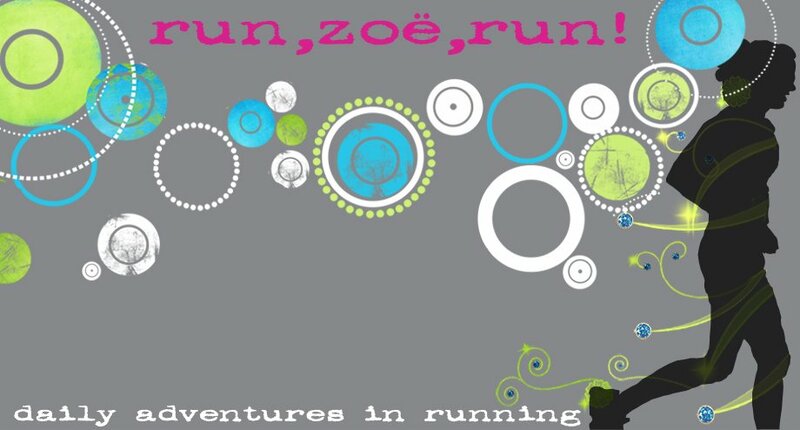 You just never know when something freaky will happen....loved your blog and keep up the miles!